REAL. New Kingdom, Ramesside Period, Ca. 1250 to 1150 B.C. 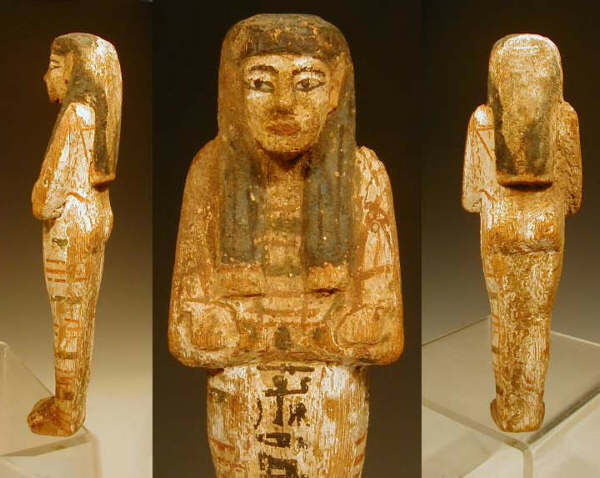 Polychrome Painted Large Wood Ushabti. Well preserved shabti with well defined facial features, wearing a long black archaic wig with braided ends, carrying two red picks, the front with a vertical inscription for the 'Lady of the House Hunur', flanked by bands of red bandaging on white. 21.5cm.